A series of four consecutive eclipses is known as a tetrad. There is a partial solar eclipse tetrad leading up to January 5, 2015, and there is a partial solar eclipse tetrad continuing after January 5, 2015. January 5, 2015 is the midpoint because the eclipses leading up to and continuing after that date are in exact symmetry, which has never happened before in the last 5,000 years. The 10 total lunar eclipses (blood red moons) — beginning on December 21, 2010 and going to January 21, 2019, and the eight partial solar eclipses — beginning on January 4, 2011 and going to January 6, 2019 — are PERFECTLY CENTERED on the midpoint — January 5, 2015 — of the blood red moon tetrad beginning on April 15, 2014 and going to September 28, 2015. All total lunar eclipses from December 21, 2010 to January 21, 2019, and all partial solar eclipses from January 4, 2011 to January 6, 2019, are literally in absolute perfect symmetry around the blood red moon tetrad of April 15, 2014, October 8, 2014, April 4, 2015 and September 28, 2015. Feast of Tabernacles or booths, also called Sukkot in Hebrew, begins on the 15th of Tishrei and finishes on the 22nd of Tishrei. Tishrei is the 7th month on the Hebrew calendar. This month falls in September or October. In 2015, Sukkot I falls on September 28th. Note: On September 24th, 2015, upon invitation by House Speaker John Boehner (R-OH), Pope Francis [the False Prophet] delivered an "historic address" to Congress. He was welcomed enthusiastically to a House chamber packed with Supreme Court justices, Cabinet officials, and lawmakers of both parties, uniting the bickering factions as all stood to cheer his arrival. The sergeant at arms intoned "Mr. Speaker, the pope of the Holy See," and Francis made his way up the center aisle in his white robes, moving slowly as lawmakers applauded, some inclining their heads in bows. He spoke from the same dais where presidents deliver their State of the Union speeches. Behind him sat Vice President Joe Biden and House Speaker John Boehner, the first and second in line to the presidency, both Catholics. He reiterated his stance on climate change, "the environmental deterioration caused by human activity" [the day before he was cheered by jubilant crowds as he visited the White House — where he and President Barack Obama embraced each others warnings on climate change]. According to The Associated Press: "Francis, 78, enjoys approval ratings the envy of any U.S. politician as he's remade the image of the Catholic Church toward openness and compassion, yet without changing fundamental church doctrine. Addressing a chamber full of elected officials, he may have been the most adept politician in the room." On September 28th, 2015, the pope ended his six-day visit to the United States. June Bounds, 56, of Rochester, New York, watched with fellow parishioners on a large screen at Philadephia's City Hall, closing her eyes and blinking back tears. "It's very overwhelming," she said. "You feel like you're one body with everyone here, whether you're here, whether you're back home, whether you're anywhere in the world." Of the pope, she said: "He's brought so much joy and holy spirit into the United States. It doesn't matter if you're a Catholic; he's just trying to unite everybody for a better world." On September 18th, 2015, France, joining U.S. forces, launched its first airstrikes against ISIS/Daesh in Iraq. On September 26th, 2015, France launched its first airstrikes against ISIS/Daesh in Syria. On September 28th, 2015, the Associated Press reported that world leaders convened for the U.N. General Assembly, a year after the U.S. president declared the formation of an international coalition to "degrade and ultimately destroy" the Islamic State group. Despite billions of dollars spent and thousands of airstrikes, the campaign appears to have made little impact. The extremist group may control slightly less territory than a year ago, but it continues to launch attacks and maintains key strongholds in Syria and Iraq. Also on September 28th, 2015, the Associated Press reported that IS may be planning attacks against Europe to spur some countries to get more involved in the anti-IS coalition. On September 30th, 2015, Russia launched its first airstrike on Syrian rebels and ISIS/Daesh. Although Western countries stated that sending in ground forces to Syria was not an option, on October 30th, 2015, the U.S. ordered the deployment of dozens of special operations troops to northern Syria to advise forces fighting against the Assad-regime and ISIS (which is also fighting against the Assad regime), adding to an increasingly volatile conflict in Syria. U.S. counter-terrorism experts have warned that deploying ground troops risks backfiring by feeding Islamic State's apocalyptic narrative that it is defending Islam against an assault by the West and its authoritarian Arab allies. ISIS/Daesh has taken responsibility for the bomb that brought down a Russian airliner in Egypt, shortly after takeoff on October 31st, 2015, killing all 224 on board. ISIS also has taken responsibility for the January 7th and November 13th, 2015 attacks in Paris. The Paris offices of the satirical French magazine Charlie Hebdo came under attack on January 7th, 2015, killing 12 people [it first was targeted three years earlier during controversy over cartoons about Islamic prophet Mohammed]. On November 13th, 2015, a series of coordinated attacks in Paris killed 130 people and injured 352, with 98 in critical condition. All seven of the assailants who died in the attacks [six blew themselves up and one was shot by police] wore identical explosive vests. There were three teams of attackers. Three targeted the Stade de France stadium where President Francois Hollande was watching the game; however, the three outside the stadium blew themselves up in near-deserted areas, killing only one person. Three targeted the Bataclan concert hall where up to 100 were massacred. More than 20 others were gunned down outside restaurants by a militant brandishing an AK-47 machine gun. Two Frenchmen living in Brussels were involved in the suicide attacks. Two of the gunmen were believed to have traveled to France by disguising themselves as migrants entering via Greece. France's President Hollande declared a state of emergency for the whole country, heavily-armed troops in body armor were deployed by the thousands, tourist sites were shuttered, and border checks were reinstated. Hollande, calling the attacks an "act of war," vowed to 'mercilessly' strike back against ISIS. In its statement claiming responsibility, the Islamic State group called Paris "the capital of prostitution and obscenity" and mocked France's air attacks on suspected Islamic State targets in Syria and Iraq. During a total lunar eclipse, the moon's disk can take on a colorful appearance from bright orange to blood red to dark brown and, rarely, very dark gray. "And I beheld when he had opened the sixth seal, and, lo, there was a great earthquake; and the sun became black as sackcloth of hair, and the moon became as blood." 6/1/2011 and 8/11/2018 are the dates of the second and seventh partial solar eclipses in the tetrads leading up to and continuing after the midpoint of 1/5/2015. 12/21/2010 - 1/21/2019 gives us 10 blood red moons in perfect symmetry. If 2015 is the year of Jubilee (beginning in September of that year), then the beginning of the great tribulation would be 1260 days prior to that, which is the Passover season of April 2012. The winter solstice in the Northern Hemisphere occurred on December 21, 2012. The Mayan calendar actually predicts the end of an age and the beginning of a new one (the age of Aquarious) on December 21, 2012, which, for the Illuminati, could be a marker for their New World Order and World Government. The biblical year is made up of 360 days (considering an ancient Hebrew month to be 30 days). 3½ years = time, times and half a time (Revelation 12:14). 8/11/2018 and 1/6/2019 are the dates of the last two partial solar eclipses in the tetrad after the midpoint of January 5, 2015. From 8/11/2018 through 1/6/2019, it is five days less than exactly five months, which in Revelation is the time period described as great torment for those without the seal of God (this is the fifth trumpet,the first "woe"). [At the sixth trumpet, the second "woe," one-third part of mankind is killed; at the seventh trumpet, the last "woe," Christ returns in the clouds of heaven]. "And I [John] saw a star fall from heaven unto the earth: and to Him was given the key of the bottomless pit. And He opened the bottomless pit; and there arose a smoke out of the pit, as the smoke of a great furnace; and the sun and the air were darkened by reason of the smoke of the pit. And there came out of the smoke locusts upon the earth: and unto them was given power, as the scorpions of the earth have power. And it was commanded them that they should not hurt the grass of the earth, neither any green thing, neither any tree; but only those men which have not the seal of God in their foreheads. And to them it was given that they should not kill them, but that they should be tormented five months: and their torment was as the torment of a scorpion, when he striketh a man. And in those days shall men seek death, and shall not find it; and shall desire to die, and death shall flee from them. And the shapes of the locusts were like unto horses prepared unto battle... they had tails like unto scorpions, and there were stings in their tails: and their power was to hurt men five months. And they had a king over them, which is the angel of the bottomless pit, whose name in the Hebrew tongue is Abaddon, but in the Greek tongue hath his name Apollyon. One woe is past; and, behold, there come two woes more hereafter." When the fig tree's branches are tender and the leaves come out, you know that summer is near. Likewise, when you see all the things that Jesus tells us in Matthew 24, you know that the coming of the Son of man is near, right at the doors. The generation (a generation being 70 years) that sees all the signs of the end times, as described by Jesus in Matthew 24, will not pass until all these things be fulfilled. When that event occurs, those . . . in Judea should flee to the mountains. They should not be concerned about taking anything with them or returning from the field for possessions, not even for a cloak. The time following this event will be a time of great distress, unequaled from the beginning of the world . . . and never to be equaled again (Jeremiah 30:7). The awful character of the Tribulation period cannot be truly grasped by anyone. This was why Jesus pointed out how difficult the time would be for pregnant women and nursing mothers (Matthew 24:19). He encouraged people to pray that their escape would not have to be in the winter when it would be difficult or on the Sabbath when travel would be limited. There was an encouraging note, however, for the Lord declared that those days would be cut short (v. 22). This meant there will be a termination of this period of time, not that the days will be fewer than 24 hours. If it were to go on indefinitely, no one would survive. But the period will come to an end for the sake of the elect, those who will be redeemed in the Tribulation and who will enter the kingdom. Do you see the point Jesus was making by talking about not waiting until wintertime to flee? He was telling us that since we know that Armageddon is near, we do not want to delay in taking action. So we would be just like those at the time of the great Flood who heard Noah but did not get inside the ark. Pregnant or nursing mothers hindered for obvious reasons. Winter would hinder because of exposure to cold and snow. Sabbath day because gates of the Jewish-controlled city of Jerusalem would be locked and they could not get out! A tetrad of lunar eclipses on feast days has only occurred two times in the last 500 years: 1949-1950 and 1967-1968. During each of those tetrads of total eclipses Israel was at war. Though Israel was declared an independent state in 1948, the war with its neighbors began after its first day and lasted for a year. Therefore, the first lunar eclipse of 1949 occurred during this war for the establishment of Israel. The next tetrad began on Passover 1967, which was just six weeks before the Six-Day-War. Therefore, these two significant wars of Israel were covered by each tetrad period. The time before those tetrads of eclipses on feast days was in 1493-1494. In 1492 the Jews were kicked out of Spain. Another interesting fact is that all of these tetrads occurred in Hebrew “pregnant years” or years with 13 months. These facts lead us to wonder if the upcoming tetrad is a sign from God that something significant will occur in 2014-2015 in regards to Israel? Will they be involved in another major war at that time, possibly a war with her Arab neighbors to regain the Temple Mount, setting the stage for major events of the end times? This is something to ponder and watch for and gives us a definite indication that the end times are upon us. The month of Av, in the Hebrew calendar, is called the “dark time.” This is when the Jews really get serious about lamenting the destruction of the Temple. They don’t bathe, they don’t shave, they don’t put on fresh clean clothes, they take their shoes off, turn their chairs upside down, sit on the upturned chair. They do not want any comfort for those next nine days from the 1st to the 9th of Av. We know that the month of Av — and especially the 9th of Av — has been the most trying period throughout history for the Jewish people. The reason being is because historically on the 9th of Av the 10 spies brought back the bad report and didn’t want the land; they despised it. Because of that, that day has been cursed in Jewish history. When Nebuchadnezzar destroyed the Temple it was the 9th of Av. 600 years later, when Rome destroyed the Temple, it was the 9th of Av. All the Jews were kicked out of England in 1290 on the 9th of Av. All the Jews were kicked out of Spain in 1492 on the 9th of Av. World War I started on the 9th of Av. Hitler’s proclamation to kill the Jews came on the 9th of Av. And they evacuated the Gaza strip at sundown on the 9th of Av. The chart above is the work of Paul Grevas, and he has given his permission to post these charts (there are others at his website) on any social medium. His site is: http://bloodmoonscoming.com/. My name is Paul Grevas. My wife, Karen of 40 years and I have lived in Helena, Mt. in the same home for the past 38 years. We have three children and are grandparents. I am Greek (and speak and write it fluently). I have been a Statistician my entire working career in Gov’t and the private sector and am now retired. We believe in Almighty God, Jesus Christ as Lord and Savior, and the Holy Spirit (3=1=Trinity). We believe Jesus was also a “Man” on earth, was crucified, buried and resurrected to our Father in Heaven. We believe he’ll come again twice, in the Rapture before the Tribulation and also at the end of the 7 year Tribulation. We believe that the Bible is truly the inspired word of God and that God does not lie. We believe in John 14:6 totally. We are devout Evangelical Christians who confess the Lord by mouth. I teach and examine Bible Prophecy in relation to today’s current events. Lastly we believe our Creator who created anything and everything that was ever created is presently supplying our world with a plethora of Heavenly SIGNS as a last call, a Clarion call that we are now at the door of the “Edge of Time”. The coming Biblical Blood Moon Tetrad is astoundingly Unprecedented and Unique. It is all about the “Astronomy” interpretations of Almighty God. It is 100% not Astrology, etc. which are interpretations of “humans”. We are so absolutely intrigued at the high correlation between Bible Prophecy and the confluence of events converging on the world today all in concert together. This, we believe is no Coincidence, of course not, as God doesn’t do Coincidences, but what he is doing is literally screaming to Grab our Attention with the coming Blood Moons and their “entourage”. For those of you whose website is large, credible, established, and popular with your viewers, and because our fledgling website is small and new and late for what God is planning in his coming Blood Moons of 2014-2015, I urge you to please consider utilizing your communicative expertise in promoting Graph 8A titled the Lord’s Perfect Tetrad (Matthew 24:14). This graph is astonishing mathematically of how awesome Almighty God truly is. The absolute perfection He has displayed in aligning all these Solar and Lunar Eclipses BEFORE the Tetrad Midpoint to be “exactly” perfect to the number of days AFTER the Tetrad Midpoint is nothing less than Issiah 46:9: (I am God and there is none like Me). And for the Biblical Blood Moons not to happen for another 600 years (2582-2583) as per NASA, can you visualize how short time is. This is the Real Deal, for what Mighty events these Blood Moons foreshadow. (Why else would the previous 7 Tetrads “warn” the world of the greatest events in world history)? The answer is simply Almighty God tells us so. With that said, we hereby give our total unfettered permission and encouragement to promote this graph 8A (and all the others). We waive all and every privacy right, copyright, patent, and all other legal rulings and arrangements because time is just too short. Our Lord is coming sooner than we may think, these Heavenly SIGNS tells us so. May you verify and judge this data for yourselves by doing the calculations yourselves. Although it is laborious time wise it is quite simple, all you need is a regular calendar and NASA website dates on all the Eclipses. Don’t believe me, believe 1 John 4:1 and you’ll know. May God Bless. 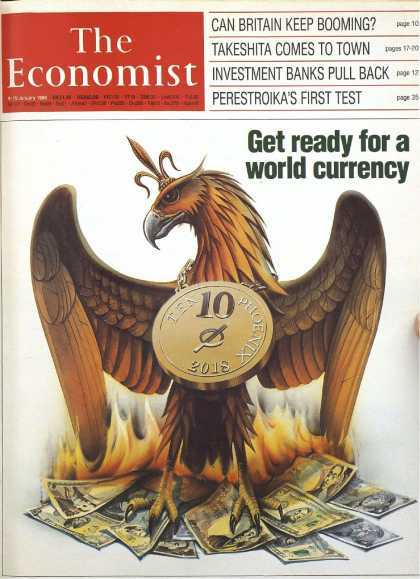 The cover of the January 9, 1988 issue (above) of the cabal-backed magazine, The Economist, depicted a Phoenix (the symbolic metaphor of death and rebirth) standing atop a pile of burning currencies, including an American $5 bill, and wearing a gold medallion around its neck with the year 2018 Inscribed on it. The headline reads: "Get Ready for a World Currency." The magazine's first issue of 2015 (below) is filled with cryptic symbols and dire predictions. Considering the facts that The Economist is partly owned by the Rothschild banking family of England and its editor-in-chief, John Micklethwait, attends Bilderberg Conferences, one should take heed of warnings issued by those who can make them a reality. The first temple was destroyed in 586 B.C. The second temple was completed in 516 B.C., 70 years after the first temple was destroyed. The second temple was destroyed by the Romans in 70 A.D.
Israel became a nation again in 1948 A.D.; the year 2018 A.D. will mark the 70th anniversary of Israel's rebirth as a nation. The third temple is where Satan will sit, showing himself that he is God, to rule over his one-world government. Touched me about the time of the evening oblation. "O Daniel, I am now come forth to give thee skill and understanding. Therefore understand the matter, and consider the vision. And to bring in everlasting righteousness, and to seal up the vision and prophecy, and to anoint the most Holy. The street shall be built again, and the wall, even in troublous times. And the end thereof shall be with a flood, and unto the end of the war desolations are determined. And that determined shall be poured upon the desolate." The 70th week has already been fulfilled. The context of the 70 weeks of Daniel prophecy is NOT about the end-times. The “covenant” in the prophecy of the 70 weeks of Daniel was confirmed by the Messiah. The reason this is so very important is that many Pastors teach that it refers to an end-times Antichrist making a peace covenant with Israel. The framework for the concepts of the pre-tribulation rapture, the seven-year tribulation period, the need for a rebuilt Jewish temple, Antichrist desecrating the temple, and the 3 1/2 years of Great Tribulation are all based on the premise that the covenant in Daniel 9:27 is created by an end-times Antichrist. By proving that the 70 weeks of Daniel is about the Messiah coming to confirm the covenant made to the Abraham, the premise of it applying it to a future Antichrist is invalidated. And thus, the foundation for all of these end-times concepts is destroyed. The Covenant of Jesus is a perfect fit with the prophecy of Daniel’s 70 Weeks. Many modern teachers say that the pronoun ‘he’ represents an end-time Antichrist who makes a peace covenant with Israel. Nowhere in the Bible does it say that Antichrist will make, confirm, or break a covenant with anyone, let alone Israel. The pronoun ‘he’ is referring to the previous noun, ‘prince,’ from verse 26. The prince is Jesus, as the word prince (nagiyd) in verse 26 is the same as in verse 25, which declares the arrival of Messiah the Prince (Jesus). There are many verses that point to Jesus confirming a covenant during His ministry, which took place during the first half of the 70th Week of Daniel. those who receive the benefits of the covenant, the “many” who believe in Him as their Messiah. Many teachers says that Antichrist will “create” or “make” a covenant with Israel, indicating the beginning of a covenant. But God’s word says “confirm” (also rendered “strengthen“), which tells us that the covenant was previously established. The Father made a covenant with Abraham that He would provide a lamb for their sins, Jesus Christ, the Passover Lamb of God. Jesus confirmed that it was He who was the promised Messiah, who would ratify the covenant as the spotless Lamb of God; by his knowledge of the Words of God, by his teachings, by his miracles, by His shed blood, by His being sacrificed as the Passover Lamb, and by His resurrection. Messiah fulfilled the promises that were made to Abraham and the Fathers of the faith. His office of priesthood is more excellent than the Levitical, because the covenant is better and established on better promises: the old covenant referred to earthly things; the new covenant, to heavenly. The 70th week of Daniel's covenant is eternal, not just for seven years. Today’s Pastors teach that Antichrist will make a seven-year covenant with Israel, but Daniel 9:27 is not saying that the covenant only lasts for seven years. It is saying that Jesus (and His disciples) confirmed the covenant for seven years. Jesus was “cut off”, crucified midway through Daniel’s 70th week. At the moment of His death, “the veil of the temple was torn in two” (Matthew 27:51). Why? Because this act of God signified that all animal sacrifices at that moment ceased to be of value, because the Perfect Sacrifice was offered once and for all. It fulfilled the law and the need for Levite priests to mediate for men! Because Jesus is the Mediator of the new covenant, so there is no separation between us and God. Jesus blood sacrifice covered over the transgressions which were committed under the old covenant, which the blood of bulls and calves could not do. It provided reconciliation for iniquity and brought in everlasting righteousness. It sealed up all Old Testament prophecies which pointed to their coming Messiah. Jesus Christ, the Lamb of God, the sacrifice to which all the Jewish festivals and sacrifices pointed, the long awaited Messiah cried out, “It is finished!” The Sinai covenant, with it sacrificial system, its rituals and animal sacrifices, was fulfilled. The 70 Weeks of Daniel's prophecy didn’t bring an end to the Jews being able to be saved: it ended the need for the religion of Judaism and the Old Covenant system, which leads to death. Jews are blinded to the Gospel and salvation under the new covenant because they refuse to read the New Testament, so a veil covers their eyes as they read the Old Testament. What about the last 3 1/2 years of the 70th week of Daniel? The early Church of Jesus Christ was formed by those of the House of Israel and the House of Judah, who accepted Jesus' new covenant. For 3 1/2 years after Jesus' death, His disciples continued to preach the Gospel to the Jews. 'Therefore let all the house of Israel know assuredly that God has made this Jesus, whom you crucified, both Lord and Christ.' Now when they heard this, they were cut to the heart, and said to Peter and the rest of the apostles, 'Men and brethren, what shall we do?' Then Peter said to them, 'Repent, and let every one of you be baptized in the name of Jesus Christ for the remission of sins; and you shall receive the gift of the Holy Spirit.' Then those who gladly received his word were baptized; and that day about three thousand souls were added to them. And the Lord added to the church daily those who were being saved. “There is neither Jew nor Greek, there is neither slave nor free, there is neither male nor female; for you are all one in Christ Jesus.” - Galations 3:28. It starts with Jesus beginning His ministry of confirming the Abrahamic covenant. For 3.5 years, Jesus and His disciples ministered to the House of Israel. Midway, Jesus was crucified for our sins, ending the need for Jewish temple sacrifices. For 3.5 years, Jesus disciples ministered to the House of Israel and the House of Judah. Some Jews accepted Jesus as their Messiah, but most rejected Him and persecuted His disciples. From that point onward, the Gospel was preached to both Jews and Gentiles. At the end of the 7 years, Stephen became the first martyr of Christianity when he was stoned to death by the Jewish leaders (36 AD), finalizing their rejection of Jesus' New Covenant. A future 70th week of Daniel is not about the end-times: this is a deception from the Jesuits of Rome. Antichrist is not just a man who will enter a rebuilt Jewish temple in the end times. It is the Roman Catholic Church, which has inserted itself into the spiritual temple of Christianity by claiming to be Christian, but they are really the old Babylonian religion of Sun and Satan worshipers. That is why they are called Mystery Babylon. The Roman Catholic Church has been seated in the temple and proclaiming to be God since 538 A.D. Antichrist doesn’t just mean against Christ, but it also means ‘in place of Christ.’ The Pope calls himself the ‘Vicar of Christ,’ which means substitute Christ. The 70 Weeks of Daniel is the only prophecy that revealed the exact year that the Messiah would appear. Other prophecies pointed to the coming Messiah, but only this one told them the exact year that He would appear. That year was 27 A.D., when Jesus was baptized and anointed — and then He read from Isaiah in the temple and proclaimed that He was the Messiah. Despite their previous idolatry and sins against God, Jesus graciously offered the Israelites salvation. The foundation of the Christian Church is built on believers who came from the house of Israel and the house of Judah. The house of Israel and the house of Judah already returned to their land and were brought together under Jesus' new covenant. But we have been deceived to focus on the modern state of Israel as the fulfillment of prophecy. In the Parable of the Landowner, the Parable of the Wedding Feast and in His “Woe to you” speech against the Jewish leaders, Jesus told them that because they rejected His new covenant, delivered Him up to be killed, and killed the prophets, He would desolate them, their city and the temple. The “days of vengeance”, the “great tribulation as never has been before”, the “time of Jacob’s trouble”, resulted in a total of 1.1 million Jews dying from famine, disease, tens of thousands by crucifixion, hundreds of thousands by infighting among themselves, hundreds of thousands by the Roman sword, and the rest were sold into slavery. The Sinai Covenant has been fulfilled and there is no way to heaven except through Jesus. Pastors teaching that the 70 weeks of Daniel is about end times theology causes Christians to mistakenly support the state of Israel. Since the Israelites regathered before Jesus first coming, there is no need for a regathering before His second coming. Jesus told the Jews that Jerusalem would be trampled by Gentiles until the time of the Gentiles is fulfilled. But the time of the Gentiles is not over yet, so if the people in Israel are Jews, then that would make Jesus statement false. But Jesus statement is proven true because 97% of people who call themselves Jews ARE NOT descendants of Abraham. They are Ashkenazi Jews, who are the descendants of Turkish-Mongols that converted to Judaism in the 8th century, making them Gentiles. The deception about the 70th week being a future event causes Christians to believe that they will be raptured before they have to face the beast. Instead of being prepared, they will run around like the foolish virgins looking for oil for their lamps. When the economy collapses, when there are food and water shortages, when WWIII pits Christian America against Muslim countries, when the world is cast into despair, unprepared Christians will become desperate for help, just like the rest of the world. Unprepared Christians will be ripe to accept the False Messiah who offers food, water and peace. And they will be susceptible to worship the image of the beast, and deny Jesus, in order to preserve their earthly life. Jesus told us to be alert and prepared. The world will be desperate for hope and the fields will be ripe. Will you be able to help with the harvest? Will you have a supply of spiritual oil of faith and love for your lamps, so that you will shine as a light in the dark world? Will you be prepared to overcome by the blood of the Lamb and by the word of your testimony, and not love your lives to the death? Satan is the master deceiver, who manipulates God's Words to deceive men. To read a study that proves that the ‘Covenant‘ in the 70th week of Daniel is from Jesus Christ, not an Antichrist, click on 70th Week Of Daniel Covenant Deception Study. To read a study that proves that the ‘Prince‘ in the 70th week of Daniel represents Jesus sending the Roman army to desolate the Jews, not an Antichrist, click on 70th Week of Daniel Prince Deception Study. The point is that all the full lunar eclipses, beginning with December 21, 2010 and going until January 21, 2019 — and all the partial eclipses from January 4, 2011 and going to January 6, 2019 — are PERFECTLY CENTERED on the midpoint — January 5, 2015 - of this current blood moon tetrad. This has literally never happened before — if NASA's data is accurate — in the last 5000 years. If you study his other charts at his site, you will see that the previous blood moon tetrads that fell on feast dates are building to THIS ONE. So, it's not just that there are four blood moons that fall on the biblical feast dates. It's that ALL lunar eclipses, partial and full, from December 21, 2010 to January 21, 2019 are literally in absolute perfect symmetry around these current blood moons. If you will go and check out his 8B chart, you will see that the solar eclipses are also involved, falling on biblically important days. This is beyond astonishing. How can it be anything other than a sign? "There will be signs in the sun and the moon and the stars." There were THREE total solar eclipses, falling on exactly Av 1 in 2008, 2009 and 2010. The lunar eclipse that starts the chart above is the very next eclipse that falls after that total solar eclipse of July 11, 2010. It's as though God was shouting via the heavens that something is coming — pay attention! And, having the full and partial eclipses leading up to and after the tetrad, as in the 2014-2015 one, being in exact symmetry, has never happened before in the last 5,000 years. That is the point of the chart. I have been following the Blood Moon subject with interest because I do believe that the Biblical reference to the sun/sackcloth and moon/blood is referring to eclipses as signs of the approach of day of the Lord. Use the actual maximum eclipse time, not just the date. If you allow the end date (January 5, 2015) to be any time the moon is visible that day, it works out. You will get days plus some hours. Those hours into the next day. For example, the one where you have 89 is actually 89 plus some hours into the 90th day. It would appear that is the way the guy did the chart, with actual eclipse time. 2/15/18 - 1137 days, 7 hours, 20 minutes. Pretty darn near symmetrical in my book. In fact, (I know this is extreme, but I tend to lean this way), I bet if I had the exact time of greatest eclipse for my town as I was able to have for the moonset, the two would be identical. And, with the hours into the next day, you'd write it as 1138 days, exactly as he has it on the chart. The fact three of these moons are visible to the Anglo-Saxon people and only One will be visible in Jerusalem ought to trigger some questions, don't you think? Ponder this fact, THREE is God''s number of finality. These moons are warnings. To whom? These are the FINAL warnings. Something important begins to happen thereafter. 2015 will be the Third "land rest cycle" since 9/11/01. Is that possibly significant? Did I dig out any thing? I haven't checked all the dates, but the ones I have are symmetrical down to minutes. Remember, if you're going to check this for yourself, you need to use the exact time for maximum eclipse — not just the date. For the midpoint, I chose a time when the moon was up in my area on January 5 — again, using an actual time, not just the date. For me, here, the moon is up from midnight to 7:32 a.m. on January 5. I am looking forward to the Supermoon in September 2015. That will be something to behold! It seems the mid-point of January 5, 2015 is the mid point of *something* but who knows what? I've tried to find out what the date would be if we back tracked 1260 days (3.5 years) from January 5, 2015 but I can't find that date. Answer: July 25, 2011. It was a Monday. The years for the start time of The Tribulation, of 2014, 2015 and 2016, are interesting because of the four Blood Red Moons in 2014/2015 — The Tetrad of Blood Red Moons on God’s Feast Days — This could be a Significant Sign and may not happen again for another 500 Years. We are currently in the 70th Jubilee cycle since the very first Jubilee, which occurred when Joshua led the children of Israel into the promised land and liberated it from the Canaanites. The beginning of that liberation was heralded with the blowing of the Yobel rams horns. The word "Jubilee" comes from Yobel. At the blowing of the seventh trumpet, the walls of Jericho collapsed. 70 is a prophetic number. Daniel the prophet spoke of 70 sevens that must be fulfilled in order for redemption to come. Jeremiah the prophet spoke of 70 years of judgment in which Israel would be enslaved to Babylon. The enslavement, by the way, occurred because Israel did not keep the statutes of the Jubilee. The noble class would not let the serfs go free. Therefore the nobles were enslaved to their worst enemy, Babylon. I would suggest that the 70th Jubilee is extra significant in that the real estate of the whole planet will be returned to its original owner, the Creator. 2015 could be the year! So what happens before then? Jesus said there would be a time of great tribulation worse than any other time in history. Don't think Satan is going to be nice about giving back the planet to the Creator. This will be WW III. The book of Revelation refers to 42 months as the time of the great struggle. IF (big if)....2015 is the year of Jubilee (beginning in September of that year), then the beginning of the great tribulation would be 1260 prior to that, which is the Passover season in April 2012. If you read Isaiah 9-10/11...the prophecy holds true...according to the Shmita...the next 7 years will end on Sept 13, 2015. It will be the 3rd and final warning from The Lord (9/11/2001 and 2008 financial collapse the first two). Consider the pole shifting of the moon in January 2012, and this is what I have contributed to part of the awakening phenomenon. Our minds, I believe are influenced by magnetic polarity but only the Earth's magnetic flux is of the greatest strength, and I do see a parallel to the Law of God in nature, as well, and by using Magnetism to illustrate it. The imagery of 144,000 may be seen in our present politics. The image of the elect is 144,000 and may be symbolic in nature, and with this idea we can see this image in our world. For examples, the image for God's elect is 144 in this example of imagery. Then we have counterfeiting of this imagery used by Satan as he manipulates his followers; his workmen use the same image as a counterfeit in a brainwashing conspiracy that does have influence on human DNA and our spiritual mind. This image of 144 is also seen in 1,144 delegates, it may be seen in the Presidential figure of the male and female, the President and his First Lady-wife. The First Lady claims the image of 1 by becoming the Fourth Reich (secretly) and her lawmakers-congressmen claim the image of the elect who are God's lawmakers. The current President is the 44th and together, he and his wife form the image of 144, which is a counterfeit for the authentic Elect lawmakers who are chosen by God and not chosen by man. 1,144 U.S. delegates must approve of the Presidential candidates each election period, and this indicates that the woman and her corrupted lawmakers are manipulating this, entirely. Verses 19 to 24 strongly suggest a very nasty worldwide socialist revolution some time during the 2013 - 2015 estimated time frame. After the Wormwood dust settles (Rev. 8), the Illuminati socialists divide the world into 10 New World Order administrative regions (“ten horns” or “ten kings” verse 24). A total lunar eclipse will take place on July 27, 2018. The moon will pass through the center of the Earth's shadow. Celestial Events corresponding to history and the Bull’s-eye Blood Moon. - Some of them are total eclipses that turn the entire moon blood red. - Some of them are central lunar eclipses, like hitting the “bull’s-eye” of a dartboard. - Some of them are visible from certain areas of the earth, i.e. Jerusalem. - Some total eclipses fall in patterns of two, three or four. - A set of four total lunar eclipses in a row is referred to as a Tetrad. - Some of them correspond with Jewish Holidays described in the Bible.. Applying the Jewish Feasts as described in the Bible as a sort of filter for these celestial events, there is a remarkable correlation between these lunar eclipses and historic events regarding the Nation of Israel. For example, there are three Tetrads falling within a current 66-year period that all occur on Jewish holidays. This is the last such sequence for over 300 years. There have been 33 central “bulls-eye” lunar eclipses in the past century, 18 of them fall on Jewish holidays, 6 on high holidays, and only one is within a Jewish Tetrad. That one is Passover, April 13, 1949, which is also the first eclipse of the Jewish Tetrad coincident with the beginning of the Jewish Nation of Israel. The last Jewish Tetrad happens to be bracketed perfectly by two central lunar eclipses which naturally define both a seven-year period according to Daniel 9 and a 70-year period according to Luke 21:32 and Psalms 90:10. And as a final note ALL of the eclipses that fall on high holidays happen to be visible from Jerusalem. May 15, 1948: The State of Israel is declared beginning a war with six Arab armies. April 3 –July 20, 1949: The armistice is signed, Israel doubles their landmass. June 7, 1967: Jerusalem captured in the six day war. June 15, 2011, central lunar eclipse, “Bull’s-eye Blood Moon”, directly in line with Jerusalem. July 27, 2018: Tu B’Av, central lunar eclipse, “Bull’s-eye Blood Moon,” directly in line with Jerusalem. Prime Minister Golda Meir said the pre-1967 borders were so dangerous that it "would be treasonable" for an Israeli leader to accept them. The Foreign Minister Abba Eban said the pre-1967 borders have "a memory of Auschwitz". Prime Minister Menachem Begin described a proposal for a retreat to the pre-1967 borders as "national suicide for Israel." The US, PA, UN, EU, Arab league, and Vatican have ALL declared support for a two-state solution to “The Palestinian Problem”, with the declaration of statehood defined by the pre-1967 borders. This was expected to happen by August 2011. The last two Jewish Tetrads marked significant events concerning Israel. Will the last one define the final seven-year period before Messiah returns? If so it was written in the heavens at creation and in the Bible for over 2,000 years. I am not saying anything will happen, what I am saying is you won’t have too long to wait to find out, watch for yourself. I did verify the blood moon dates using StarryNight and they are correct. June 15, 2011 (blood moon) to July 23, 2018 is 2595 days; just 4 days later is July 27, 2018 (blood moon) a total of 2599 days. From and including: Wednesday, June 15, 2011, blood moon over Jerusalem at approx 10:30pm. To, but not including : Friday, July 27, 2018, blood moon over Jerusalem at approx 10:30pm. I am not certain what this all means but find it very, very interesting to say the least. 2018 AD = Full Blood Moon over Jerusalem on July 27, 2018, which will be on a total lunar eclipse. The moon will pass through the center of the Earth's shadow. Thus, on July 27, 2018, a central lunar eclipse, or “Bull’s-eye Blood Moon,” will be directly in line with Jerusalem and wholly visible in all of Israel. It will occur within seven days or July 21-22, 2018 (July 27 vs. July 21, or seven-inclusive days) commemorating the 9th of Av – the DESTRUCTION of the Solomonic and Herodian Temples in Jerusalem (day of fasting). From Passover, March 30, 2018 or Nissan 14/15 to July 27, 2018 will be precisely 120 days (inclusive dates), possibly signaling the onset of the 120 Jubilee cycles (120 x 50 yrs. = 6,000 years). NOTE: Passover in 2018 will take place on March 30 (Passover) to July 27 = 120 days (inclusive - full eclipse of the sun and blood red moon over Jerusalem, within 7 days of the 9th of Av, commemorating the destruction of both Temples of Solomon and Herod) plus an additional 130 days (or 120 days + 130 days = 250 days) bringing us to the Feast of Dedication (250 days between any given Passover 14/15 Nissan to any given Feast of Dedication 24/25 Kislev – Feast of Dedication in 2018 will be on December 2, 2018. What Happens If a Solar Flare, EMP or Plague Wipes Out Our Technology Base? Will the U.S. Military Fire upon U.S. Citizens?